A tasty treat that could leave one craving for more! Gift a wholesome treat to your loved ones with this exquiste gift hamper. 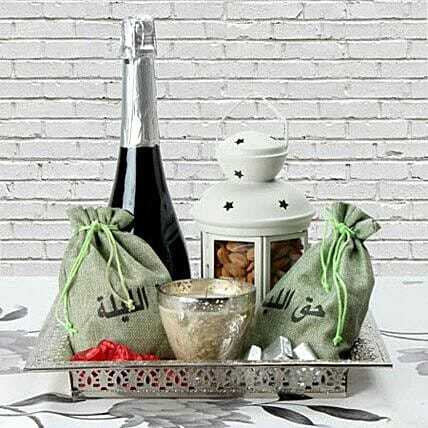 It comprises of green lantern filled with dry fruit, handmade chocolates in a green jute bag, glass candle and a bottle of sparkling juice arranged on a carved silver tray. This gift hamper is sure to be a perfect gift for your dear one on any festive day. This lantern is made of ceramic and is breakable.